MaryLou Hanold age 90 of Richland Center passed away peacefully at home with her son by her side on Sunday, April 7th, 2019 from a 5yr battle with Dementia. She was born to James and Glennie Pliner on 1-17-1929 in Gillingham. She graduated from Richland Center High School. After high school she worked at Clarson Ice Cream for 9 years. She married the love of her life William James Hanold on 2-14-1959 at Ash Creek United Methodist Church. 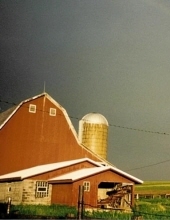 They lived and farmed together at the Hanold Farm until the time of his death on 1-29-1988. Mary Lou received the Outstanding Farm Wife Award for all her years of dedication in the farming community in 2006. She was best known for her prestige garden that never had a weed in it! She spent her retirement helping to raise her grandchildren who she adored. She took them to school and prided herself by attending all of their many school activities. She stocked them all up with cookies for camping and college. She always had a freezer full of ice cream for them and many of their friends when they came to visit. She will be remembered by her giving nature and beautiful smile and will be missed tremendously. Mary Lou was preceded in death by her parents and her Husband Bill, a brother, Gideon (Alene) Pliner, and a sister-in-Law, Hilda Unbehaun. Survivors include her son and daughter in-law, Steven and Colleen Hanold, 4 grandchildren, Tyler (Brooke) , Nicholas (Olivia) and their mother Denise Lins, Alyssa (Shelby) and Brennen Hanold We would like to thank our wonderful children and many friends who always supported our decision to care for mom at home and were there when we needed encouragement to continue this care when times were difficult. To our wonderful caregivers Rita Parduhn, Sue Davis, Elona Martin, and Dominique Hostettler, without your dedication and care for the last 5 years we would not of been able to keep our promise to keep Mom at home, we thank you from the bottom of our hearts. Funeral services will be held on Saturday, April 13, 2019 at 11:00 A.M. at the Ash Creek United Methodist Church. Pastor Tammy Clausen will officiate with burial in the church cemetery. Visitation will be held on Friday, April 12, 2019 at the Stafford Funeral Home from 4:00 P.M. -7:00 P.M. and again on Saturday at the church from 10:00 A.M. until the time of service. Memorials may be made to the Ash Creek United Methodist Church. Online condolences available at www.staffordfuneralhomes.com. The Stafford Funeral Home is assisting the family with the arrangements. "Email Address" would like to share the life celebration of Mary L. Hanold. Click on the "link" to go to share a favorite memory or leave a condolence message for the family.